A mysterious team of extraordinary guardians from a place of eternal October protect the sleepy, rural town of Woodland from supernatural menaces - but can the Skeleton, the Witch, the Ghost, and the Devil defend against a full-on UFO invasion? 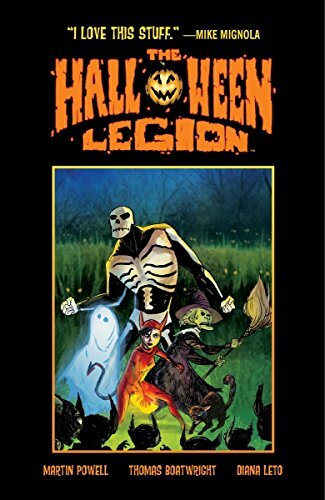 This pulpy, all-ages adventure, spooky yet whimsical, is sure to stir up breezy, autumnal memories of Halloweens past. Also includes the autobiographical short comic "Once Upon a Halloween."